So, here we all are, in our team shirts and ready to go! 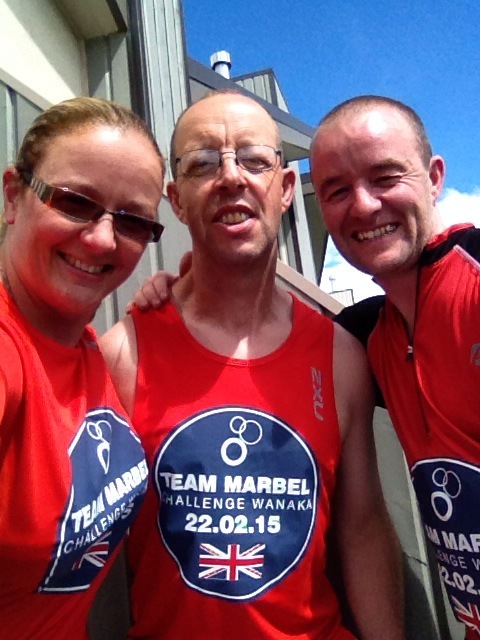 Team MARBEL is made up of Mark: runner (centre), Ben: cyclist (right) and Mel: swimmer (left) swimmer – aka Me! We actually set off in reverse order to that, but that was the best combinations of our names that we could come up with! Dinner: chicken and Taro stir fry, fruit salad. Today was race prep. We started the day with the race briefing, which was amusing, informative and as usual, full of silly people asking dumb assed questions! From here, we did a recce of the bike course in the car. The Mount Aspiring road is always a stunning road to drive up, off into the mountain range, indescribably beautiful. From there we are back in town, straight through it in fact and off towards Albert Town and lake Hawea. Another beautiful area, but a lot more wide open flat valley, and it actually felt a lot more remote. Hawea village was a tiny wee quaint spot, another stunning lake. The rest of the bike course felt incredibly long and remote before arrive back into Wanaka, to complete lap 1! I’m glad that leg isn’t down to me! Still, I can see why it won an award for the most scenic triathlon in the world! Chillaxing made up the rest of the day before Ben’s bike had to be racked after 3pm. Team walk through of transition completed the day, off home to the apartment for a stir fry tea and relaxing before the big day! Wish us luck, we are #419 and you can follow live tracking on the challenge Wanaka website.